German traffic patrol is about to get a touch more refined and luxurious. 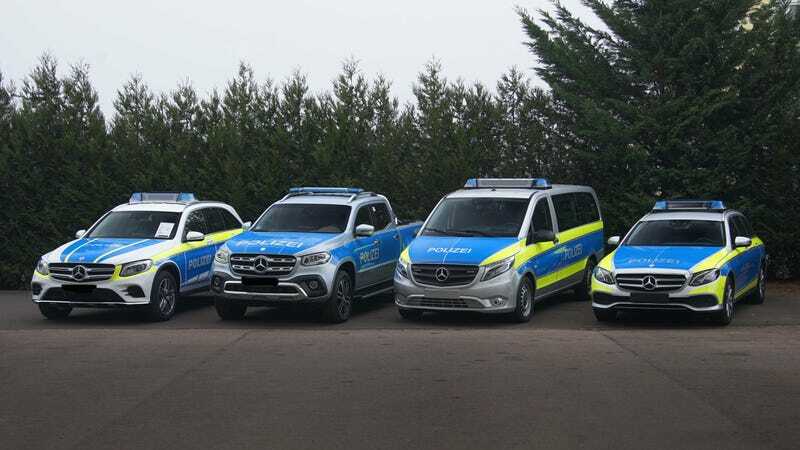 According to CarScoops and a press release by Daimler, Mercedes is set to unveil their new line of European police cars at the General Police Equipment Exhibition and Conference in Frankfurt later this month. One of the new additions to the fleet is the Mercedes GLC 350 eMatic, the plug-in hybrid version of the GLC. That’s all well and good. I’m sure fuel-efficient police cars save a lot of money. But I think the new X-Class is the real star addition. It’s the most recent attempt by Mercedes to make a real pickup truck and they are sure as hell going to use it. I don’t think it looks half bad in “POLIZEI” livery. With to the GLC and X-Class, Mercedes is also going to unveil the new police versions of their Vito van and E-Class estate. Mercedes did not mention, however, if there would be an E63 AMG estate police car but we will just have to wait and see if anyone wants to order one. So the next time you’re in Germany, watch out, because you might get pulled over by a luxury station wagon.